Choose Rick Gruel Landscape & Design LLC for All Your Landscaping Needs! My wife and I had struggled for years to come up with a landscaping plan that not only tied together, but complemented the natural features of our property. Thanks to Rick Gruel Landscaping and Design, that goal has been attained - and the process was actually enjoyable from start to finish. We recommend Rick and his crew most highly. 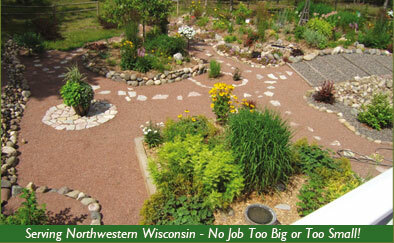 Rick Gruel Landscaping & Design is Northern Wisconsin's premier professional full service landscape & design company that provides creative solutions for your new home or residence, commercial and industrial properties. Our company is a leader of the landscape industry with high quality products and a wonderful design team and fantastic staff that take pride in our work and provide great customer service. Our company specializes in many different aspects of landscapes & design services: working on lakeshore restoration/mitigation plans, working on patios and walkways, light excavating services to lawn care, retaining walls, stump grinding and tree services. For each landscape project, our well trained staff devotes a certain amount of time to proper erosion control. 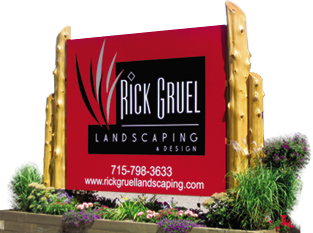 At Rick Gruel Landscaping & Design our goal is to work with you to provide a beautiful landscape design that will enhance your residential and/or business property. We have worked with many people to either clean up the property, improve curb appeal and/or increase the resale value of the property, home or business. Our skilled and certified staff are very talented and provide the finest results. We select products that will work best on your property and provide quality installation and to ensure proper growth and longevity.